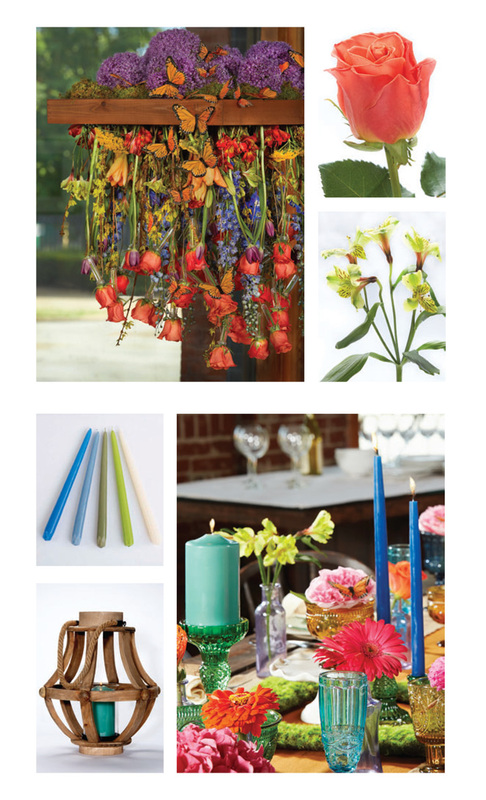 Natural elements balance the bright color spectrum in the Folk Art Reinvented wedding. 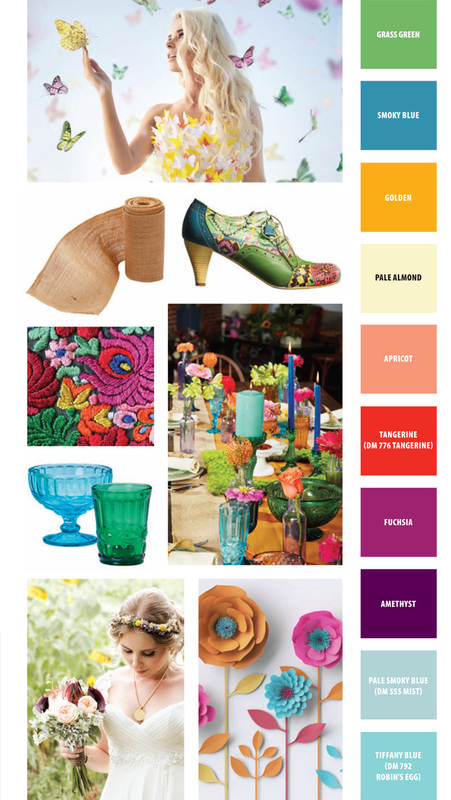 The trend entices the bride with an explosion of mixed, bold colors and encourages her to take the garden style to new heights. Bouquet designs will vary in size, shape, and flower choice, but none will outshine the freeform bouquet pictured here. A well-balancedmix of colors, shades, flowers, and accent foliages is key to creating the ideal Folk Art Reinvented freeform cascading bouquet. 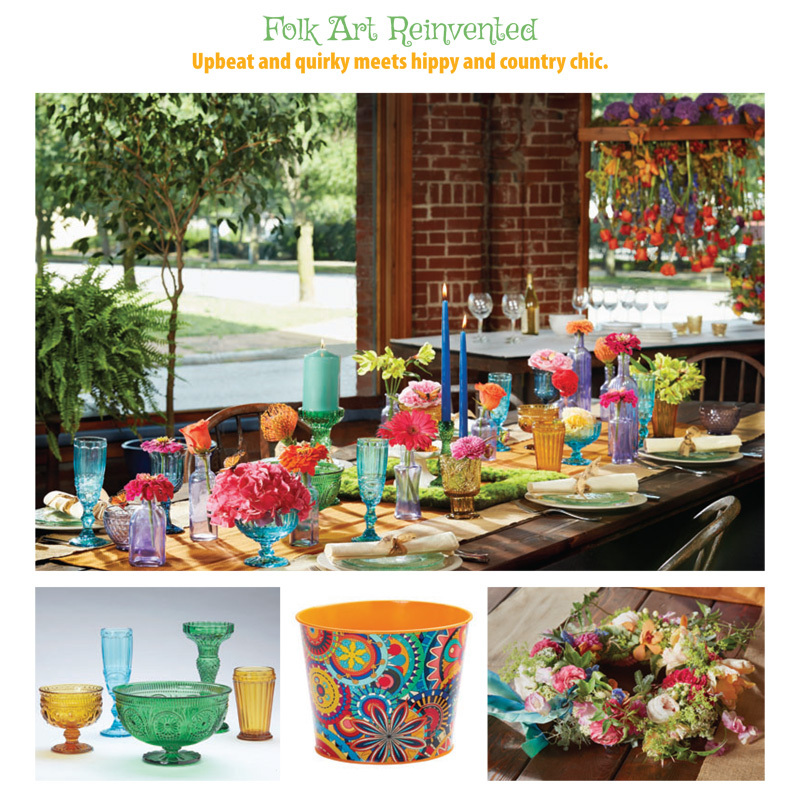 Rich, saturated colors establish a quirky yet vibrant feel to the Folk Art Reinvented look. The selection and colors of candles from Patrician Brand candles from Candle Artisans helps finish the upscale crafty look and draws in guests. The broad range of colors from Candle Artisans makes it easy to achieve the well-balanced mix of colors needed to create Folk Art Reinvented. Folk Art Reinvented emanates an eclectic expression of pure pleasure and whimsy. Its quirky personality repurposes the typical garden flair as the hippy style meets country chic. Folk Art Reinvented shocks with its saturated oranges, greens, and pinks that pop against subtle tones of peach, cream, and sage. 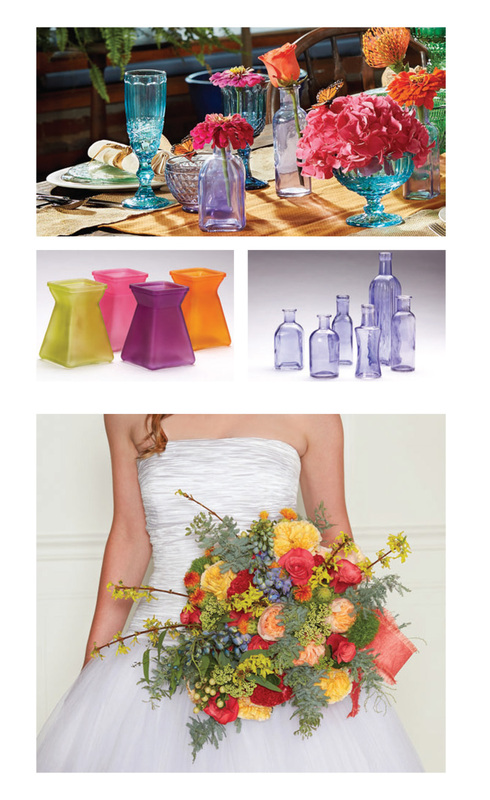 Bright blooms of gerbera daisies, zinnias, alstroemerias, and roses captivate in one-of-a-kind richly colored glass vases. eccentric accents and patterns, like butterfly motifs, express the spirited allure of Folk Art Reinvented.